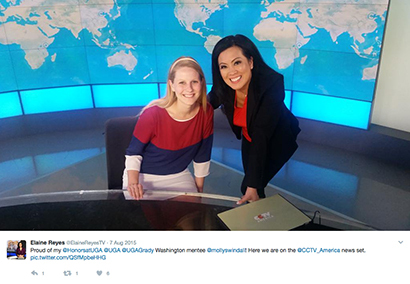 Elaine Reyes (ABJ ’97) of CCTV America mentored Molly Swindall, a digital and broadcast journalism major. Alumni and friends of Grady College are available to participate in our college-wide Mentorship Program. The Mentorship Program is a structured opportunity for current undergraduate and graduate students to connect with alumni and friends of Grady. The program runs from September-April every academic year and asks mentors to commit to one 30-60 minute mentor/mentee conversation per month. These conversations will center around topics such as professional skills needed in today’s world of work, diversity and inclusion perspectives, and other topics based upon students interests. Mentors do not have to be based within the Athens area. A formal call for mentors occurs annually in June. For more information, please feel free to contact Kelvin Rutledge, director of Experiential Programs. 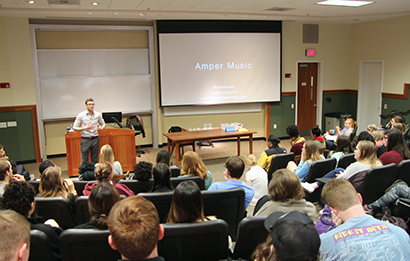 Matt Kabus (ABJ'12) speaks to an NMI class about his experience with the startup company Amper Music Inc.
We’re thankful for the many engaged alumni who visit Grady or invite classes or student clubs to their companies to share about their careers and research. For a list of clubs and organizations, please visit our Grady Students page. 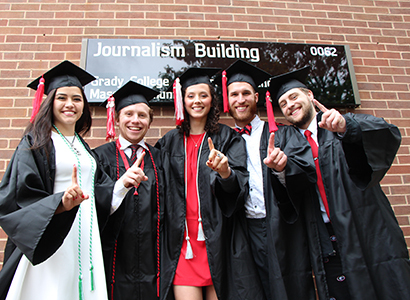 Grady College depends on the generosity of our alumni and friends to help students and faculty succeed. With your support, we will strengthen our commitment to inspiring students and preparing them to illuminate the world upon graduation. We are grateful for your kindness. Thank you for your gift! To make a gift, please visit Grady.uga.edu/give-to-grady.